The above quotation from the Los Angeles Times is on the cover of Roxana Robinson’s book, “Georgia O’Keeffe: A Life.” Before I read it recently I did not know that much about this artist’s personal life other than that she was married to the photographer Alfred Stieglitz and spent her last years in New Mexico. Robinson begins with the first O’Keeffes who emigrated from Ireland and settled in Sun Prairie, Wisconsin in 1848 and ends with her death in Santa Fe, New Mexico in 1996 at the age of 98. In the pages between she reveals the life of the artist sometimes most know for her large flowers and her vision of the Southwest that included animal skulls. For her time even as a young woman she was quite liberated as she pursued her education and art and dressed as she pleased. She moved to New York where she studied art and met Alfred Stieglitz for the first time. 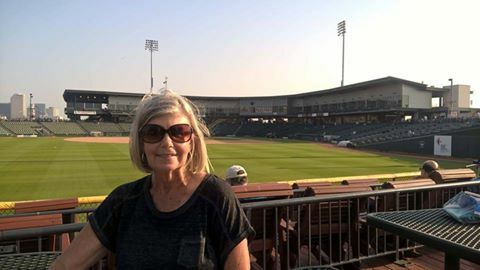 For a time she taught art in Amarillo, Texas and apparently fell in love with the desolate landscape. A few years later she fell in love with Stieglitz. 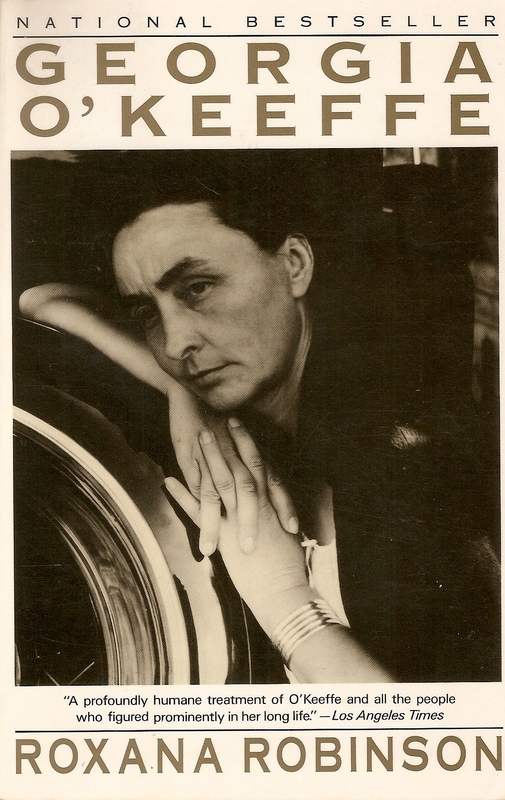 From reading this biography it seems to me that O’Keeffe struggled to balance her need for independence and her passion for creating art (she called it her “work) with the obligations of married life. She and Stieglitz had no children together so she did not have to factor in the responsibilities of motherhood. Although her marriage was unconventional, perhaps she was no different from women today who have to make choices about career, marriage and children. It takes a strong woman to make the difficult choices; Georgia O’Keeffe must have been a strong woman. ← HE DIDN’T QUIT HIS DAY JOB or IS YOUR DREAM DUSTY? I agree! She is a great American artist. I appreciate your visit and taking time to share your thoughts! If you came across the film Georgia O’Keeffe starring Joan Allen and Jeremy Irons, it is well worth watching. She was an interesting woman for sure and left us with works of great beauty. I have not seen the movie but will want to check it out. Enjoyed reading the post. Her struggled to balance her need for independence… was ahead of time. Thank you. Yes, I agree that she was ahead of her time for independence. Love her art. She’s always next to me in an oversized art book leaning on my wall. I love her art also. Her art always seems oversized and there for women. Thank you for commenting! You continue to inform, educate and inspire us with your blog posts! I tend to merrily skip through life and enjoy and investigate things here and there. You have given me a new insight into this amazing woman. I shall look at each piece of her work through a different eye. The flag painting is brilliant……..have never seen it before. She does seem so very interesting. Oh, Tin Man, I think I skip here and there with my posts to write about what interests me and am glad when someone finds it of interest too. You educate us with your travel pieces! I had never seen The Flag before but was taken by it too. She was quite liberated and enjoyed the life tolerance of Taos. Your comments are always important to me. I have this book on my list of “must reads.” Thanks so much for sharing. Thank you! The book was a library sale find. Georgia O’Keep is one of my favorite artists. I love this water color. She is one of my favorites too but I had never seen this water color. It is not a traditional rendering of our US flag but to me it reflects her disregard for the traditional. I do remember PBS had a drama starring Jane Alexander about O’Keefe’s marriage to Stieglitz. It was very good, as I recall. I am so sorry that I missed that one. Jane Alexander was certainly a good choice to play O’Keeffe. Thanks for taking time to comment! Whenever I visit the Met, I make sure to find at least one O’Keeffe to look at. She was a very interesting woman and ahead of her time! Lucky you to be able to view her originals! Yes, she was indeed ahead of her time. I wonder what she would think of the progress of women today? Thanks for the visit! Stay cool! I think she would be pleased to some extent- though gender roles are still a challenge. I agree that all is not equal with the sexes yet! At least women have more choices. I have always loved her work, especially her desolate deserts. As much as I love being near water, I also love being in wide open spaces and Georgia O’Keefe painted those spaces to speak to my heart. I will have to search out the book and PBS show. Thanks for the heads up. I love New Mexico – Santa Fe, Taos – and think I could live there as I like the simplicity of the land and space and architecture. I live on the coast but the openness is almost like the openness of the desert where sky and land/water blend. Her marriage was unconventional and she would need time away from Stieglitz and had male and female friends. I would like to see the PBS show also. Your comments are always appreciated! I enjoyed reading it as I did not know much about her and I like to throw in a biography with my fiction reading. Thanks for taking time to comment! Fascinating woman who rendered such beautiful works. It would be a great read to read this one or another about her life. I love her very muted pastels that appear almost white. Thank you for stopping by my site today. I too, enjoyed exploring your site. 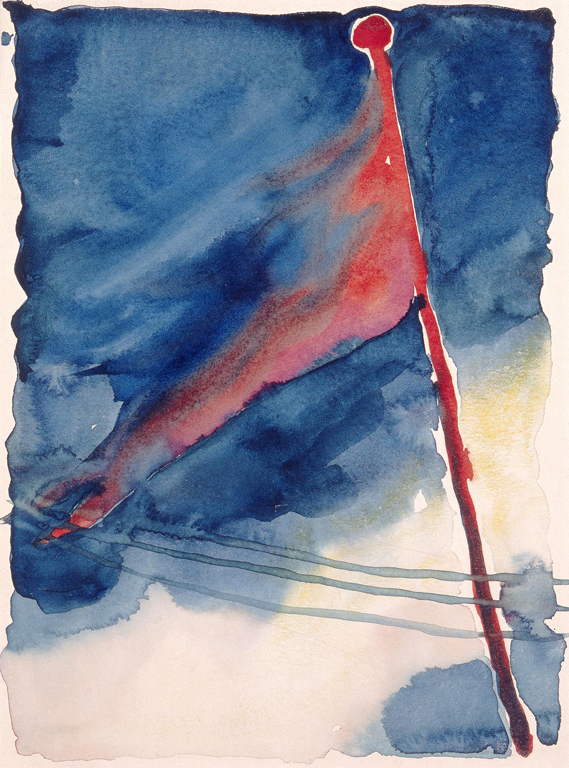 Yes, I really liked “The Flag” too and had not seen it before. It was a pleasure visiting your blog. I appreciate your taking time to call upon me and comment! All the best to you! I missed this post while I was reorganizing so I wouldn’t miss posts… Figures. Thanks, Yes, I’ve always thought she was an extraordinary and strong woman. I know only the basics of her life – the book will go on my list. I saw a show of hers in DC in mid-80s. Her huge canvases of clouds seen from a plane are also favorites on mine, and many of the flowers – not so much bones. Lucky you to have seen one of her shows! The bones are not my favorites. I think you will enjoy the book. I don’t know much about Georgia O’Keeffe, but this post makes her sound very intriguing. I’m going to have to read this book. I thought she was quite interesting. So much is written about male artists that it was nice to learn about a female artist. Your comments are always appreciated. We in NM cherish her, her work and her legacy. The O’Keeffe Museum is a must see for any out of state visitors. I, too, like The Flag. Hadn’t previously seen it. Unfortunately, I have never been to the museum on my visits to New Mexico. They were always short trips and there is so much to see in those wide open spaces. The next trip it will be at the top of my list! Thanks for taking time to comment!